BEIJING - One more popular food on the dinner tables of Chongqing residents - curdled animal blood - has been found to be unsafe. The discovery was made during a massive campaign to look for food hazards following a proposal by legislators from the city to penalize those who profit from unsafe food. News of the latest food scare surfaced after regulators raided an unlicensed food processor in the Southwestern municipality on Thursday. The inspectors found that the company had been adding formaldehyde, a liquid more commonly used to preserve bodies and which is banned in food, to make blood curdle. The raid turned up 2,500 kilograms of curdled blood that had been contaminated with the substance. 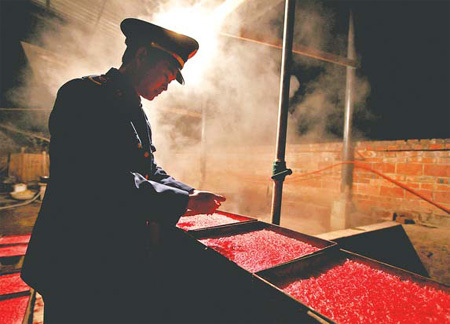 "For every kilogram of curdled blood, the company had used more than 100 milligrams of formaldehyde," said Luo Yongquan, head of the food distribution supervision division under the Chongqing administration for industry and commerce. Luo said the processor made and sold about 2,500 kg of curdled blood every day. People coming into contact with formaldehyde can develop skin diseases, hepatitis, pneumonia and sustain kidney damage. According to Luo, his division raided three factories that were suspected of using formaldehyde early on Thursday. Traces of the preservative were also found at the other two plants. "They normally operate without a license in remote village homes where the hygiene levels are low," he added. Luo said his administration issued a notice to its affiliates in 43 districts and counties throughout the municipality calling on them to promptly test for formaldehyde at all markets and to forward suspicious curdled blood to inspection institutes. The revelations were the latest in a string of scandals involving the safety of food in the province since the authority started a "100-day special operation to uphold food safety" during a televised conference on March 9. Also on that day, 438 national legislators, led by the director of the Chongqing municipal public security bureau, Wang Lijun, proposed a new law at the National People's Congress. The law will call for heavy punishments for those who intentionally add banned substances to food in order to make a profit. On Sunday, the administration summoned the regional manager of Wal-Mart after the global supermarket's Chongqing operation had allegedly re-fried and sold expired salted ducks. The administration then warned Wal-Mart's Chongqing operation to make changes or face serve punishments, including having its license revoked. According to local media, Yang Guowei bowed and apologized to customers. Luo said the priority of Chongqing's campaign, which will continue until mid-June, is to ensure food favored by the public is safe. Items coming under particular scrutiny include rice, cooking oil and hotpot soup base. Luo and his colleague, Wu Jipin, the division head of law enforcement under the administration, said the campaign is more concerned with the safety of products than whether they are counterfeits of branded foods. "In addition to professional testing agencies, the police are also working with us during this campaign," Luo said. "We contact the police so they can be involved early in potentially criminal investigations."